Reunion committee members (from left): John Tsukahira, Hank Iwamoto, June (Iwamoto) Tomita, Judy (Iwamoto) Okita, Fujio Nakagawa, Norman Sakamoto, June (Yahata) Fujioka, Lillian (Noborio) Matayoshi, Aya (Shirasawa) Masada, Jack Fujimoto. 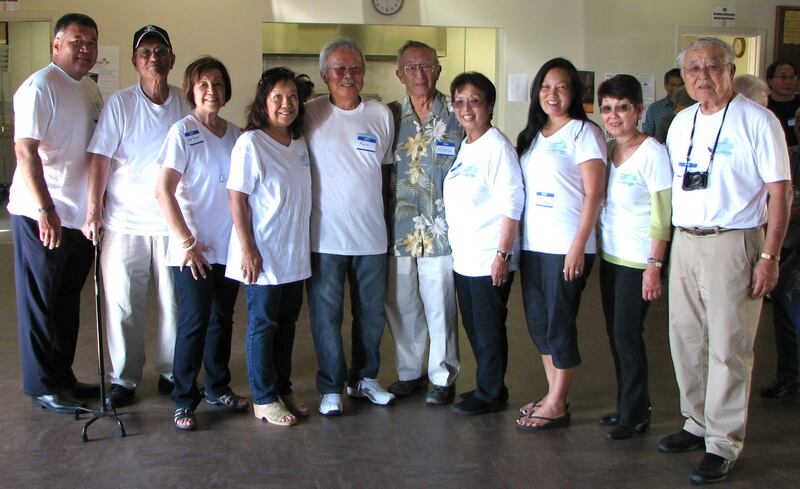 Sawtelle Reunion III was held Oct. 19 at West L.A. Buddhist Church with more than 150 people in attendance. 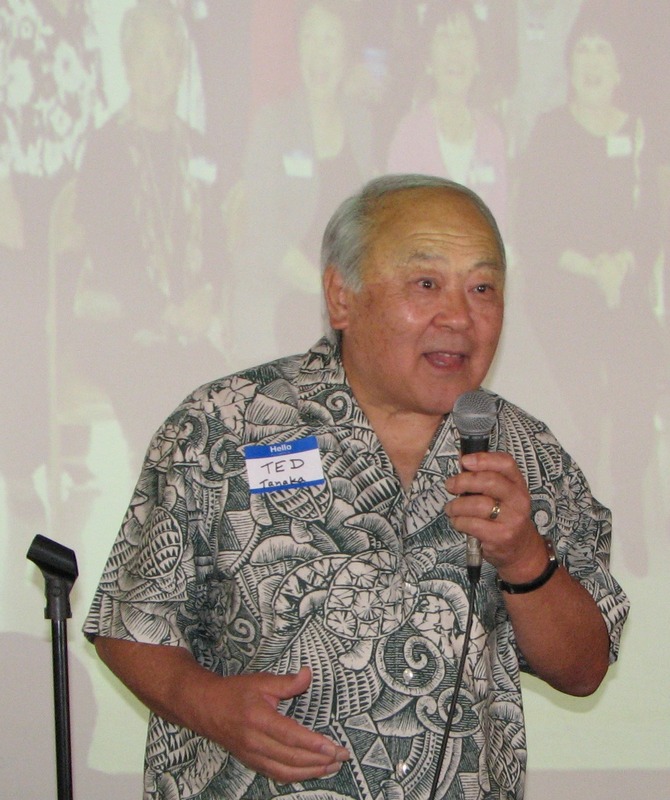 Ted Tanaka is working on Sawtelle’s centennial commemoration. Speeches were kept to a minimum as attendees chatted over food and drink. T-shirts commemorating the occasion were handed out. On display were several photos from decades past, many of them collected by Randy Sakamoto, who has published books about the history of Sawtelle’s Japanese American community. Fujimoto noted that Sakamoto could not attend this year’s Sawtelle reunion because it coincided with his wife’s high school reunion in Modesto. Also on display were copies of Wee Bruin, which showed student life in the immediate postwar years. “Anybody who went to Nora Sterry Elementary School, your story is probably in there,” Fujimoto said. Among other projects, organizers plan to ask the City of Los Angeles to put up a sign identifying the neighborhood as “Sawtelle Japantown.” They point out that unlike other Japantowns that have almost disappeared due to the internment and postwar redevelopment, such as the ones in Sacramento and San Diego, Sawtelle is still a distinctly Japanese American district. 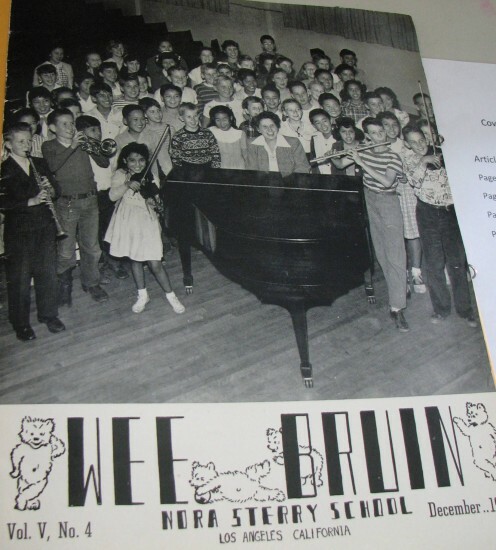 The cover of the December 1948 edition of Wee Bruin, a publication of Nora Sterry School, from the collection of Yoshie (Ishii) Tachiki.